When choosing a handicap shower seat, you have to understand the needs of the user. This will help you make the right choices in size, material and use. Handicap shower seats can be purchased in several different styles. These seats are ideal for people who may not be able to stand or walk on their own. They can be free standing in the middle of the shower or bathtub, or mounted on a wall. 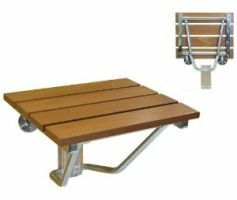 The mounted seats can be installed permanently in the seated position or have the ability to fold up when not in use. Handicap shower seats are made of plastic, teak, steel and a number of other materials that can withstand water. Some of the seats have padding to make them more comfortable for wheelchair and elderly users. The shower seats are usually made to prevent mildew growth so this reduces the amount of cleanup and maintenance. Some of these handicap shower seats have wheels and act just like a shower chair. They have back and arm rests to make showering more comfortable while providing extra support. 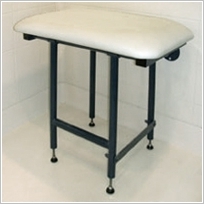 A person that only needs a little help can benefit from a shower seat. For those who are unable to safely stand in a shower, they will be able to safely bathe themselves without the worry of getting tired while standing. These seats can also offer them the privacy of taking a shower alone. Wooden Bath Seat Wall Mounted – These are wall attached handicap shower seats. Beautifully designed teak wall mounted chairs that supports 300lbs. Teak is a natural wood resistant to bacteria and rotting. Fits conveniently in the smallest of shower stalls. It will last for many years in a wet environment. Wall Mounted Shower Seats – White wall mounted shower seats that supports up to 250lbs. Fold up the chair once you are done with it. Folding Up Shower Seats – Limited supply Brazilian walnut wood shower seat. Shower seats can offer another option for those that are confined to a wheelchair. During a shower transfer, a person can be moved directly from their bed into one of these portable shower seats and wheeled into the shower area. Some of the shower seats can also double as a commode. Some medical insurance will cover the cost of a handicap shower seat if it is deemed medically necessary. Handicap shower seats start around $40. Some of the more deluxe models can be as much as $500.